Exeter Cathedral currently contains three working pipe organs. 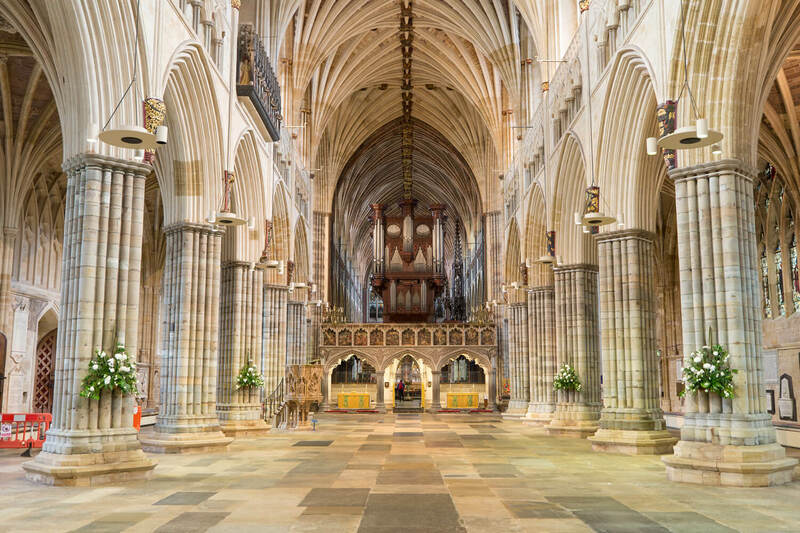 Exeter Cathedral currently contains three working pipe organs, all of which are used regularly to lead worship or as part of concert performances. 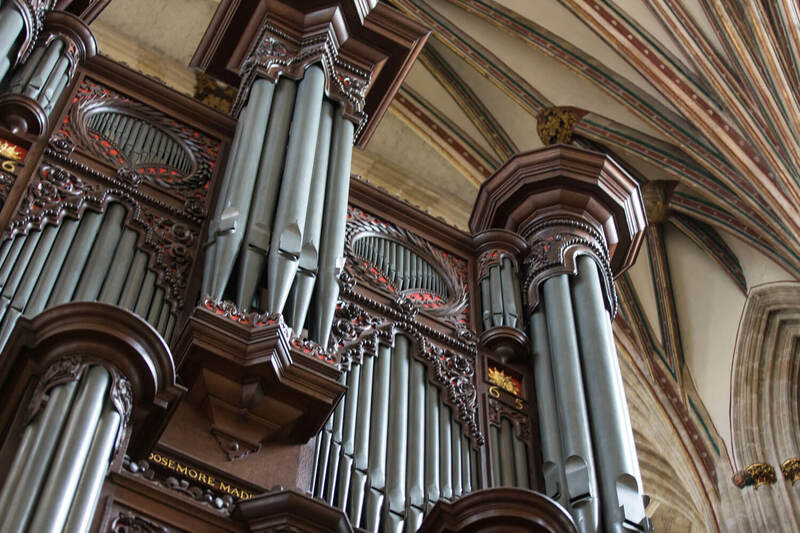 In 1665 local organ builder John Loosemore created what has become one of the most distinctive and striking organ cases ever built. In over three hundred years the organ has been expanded and updated to meet the ever changing musical demands of a living Cathedral, from the expansion and raising of Loosemore’s case and the moving of the impressive 32’ pipes to the South Transept, to the creation of an entirely new section of the organ in the Minstrels’ Gallery. 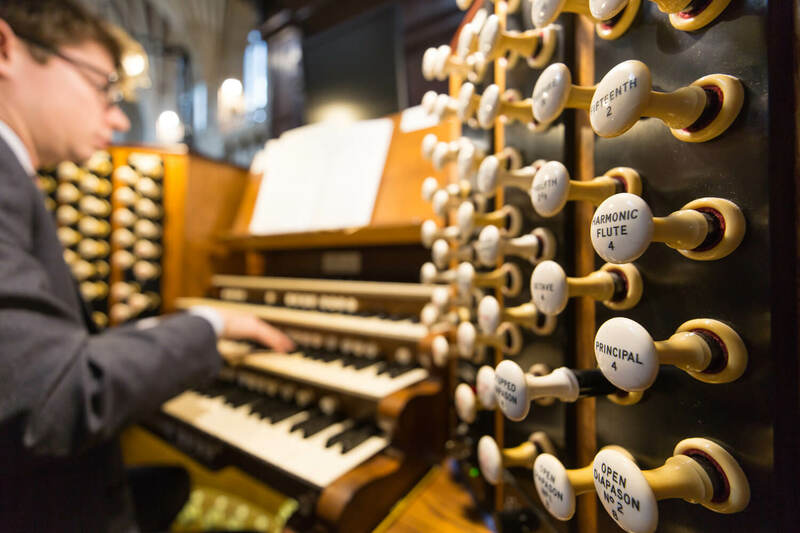 Containing over 4000 pipes, the organ is played from a console of four manuals and pedals which is situated on the central ‘pulpitum’ screen. 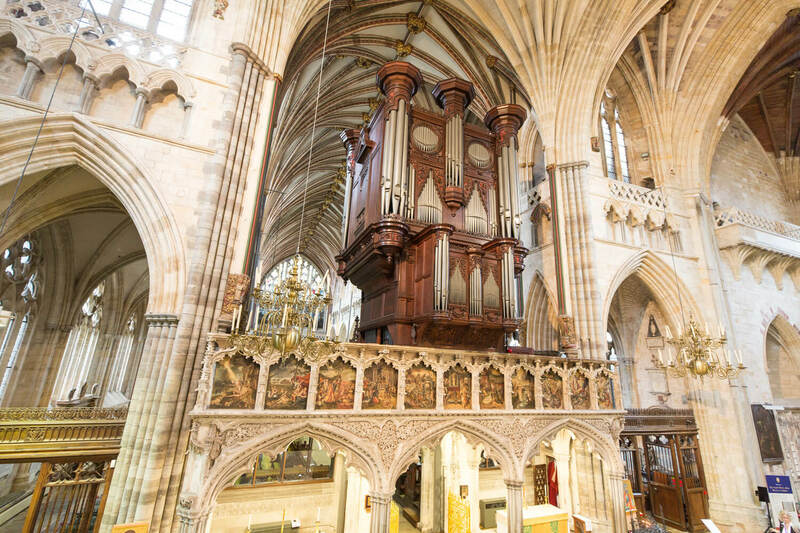 This specification is reproduced with permission from the 2017 reprint of Heavenly Harmony: Organs and Organists of Exeter Cathedral by Malcolm Walker and David Davies, published by Impress Books Ltd (2014). A 6 rank chamber organ by Samuel Parsons (built c. 1840) is used to lead services in the Lady Chapel. 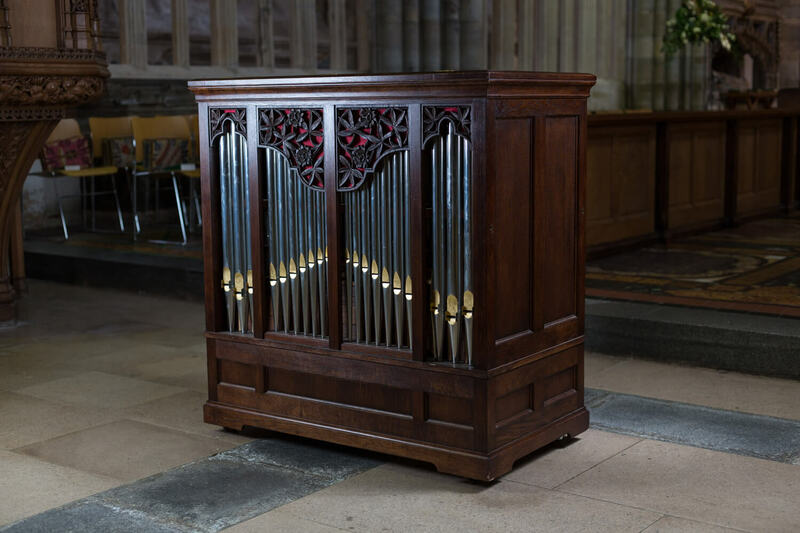 A chamber organ for Exeter Cathedral was delivered in January 2008 by organ builders Kenneth Tickell. The casework is of darkly polished Oak, with tin front pipes having gilded mouths. The pipeshades are developed from a Passion flower motif which is featured on the Dean’s stall in the Choir. The keyboard can transpose to A=415, 440 and 465, and it is also possible to tune at A=430. The shifting movement pedal facilitates performance of the verse anthem repertoire, and the inclusion of a Principal at four foot pitch gives a choice of colour in the mid range of the instrument. Suspended tracker key action : Mechanical stop action. Slider soundboard : Shifting movement pedal to silence upperwork. 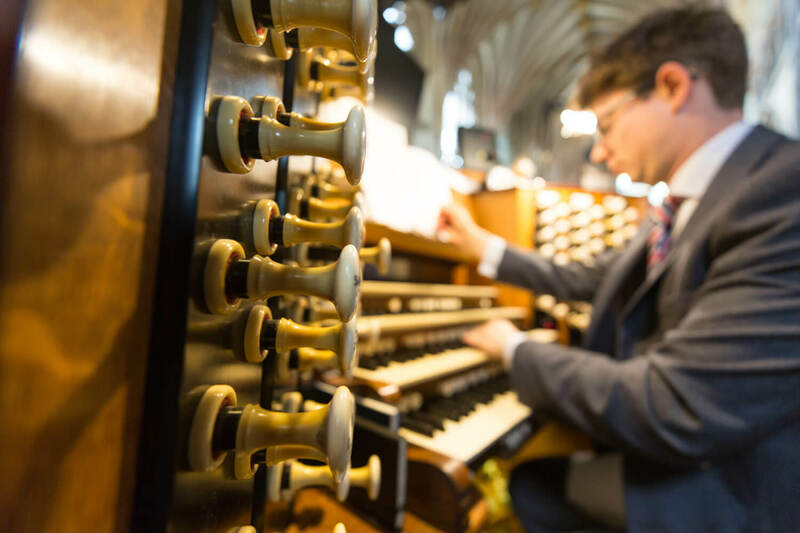 If you can make a financial contribution to the considerable cost of providing first-class music at Exeter Cathedral then we would love to hear from you.